Maybe compare different cities and countries for pollution reputation and health effects, which will probably reinforce that reputation. 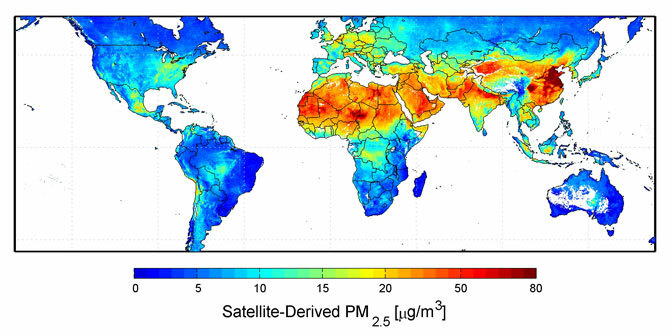 Now, with this map and dataset in hand, epidemiologists can start to look more closely at how long term exposure to particulate matter in rarely studied parts of the world — such as Asia's fast-growing cities or areas in North Africa with quantities of dust in the air — affect human health. The new information could even be useful in parts of the United States or Western Europe where surface monitors, still the gold standard for measuring air quality, are sparse. Hm, that could have "social consequences", and not just in China. In the U.S., if people knew how much more polluted areas near coal or biomass plants were, new plants would less likely to be built, and switching over to nonpolluting renewable energy could go faster.